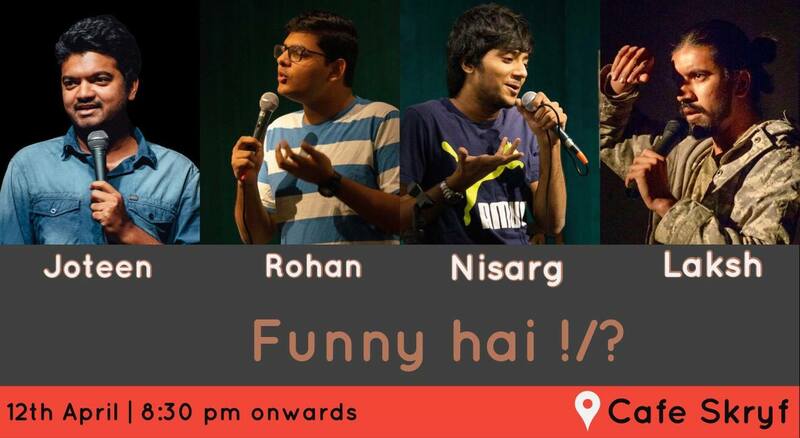 A Stand Up Comedy Show - Funny Hai !/? 2019-04-12 20:30:00 2019-04-12 22:30:00 Asia/Kolkata Funny Hai !/? Stand Up Comedy show hosted by Cafe Skryf and Youcomedy on Friday 12th April – 8:30 PM onwards includes comics from Ahmedabad and specially invited comics from Bangalore for this crazy laugh riot. Don’t miss out on this show to see some amazing comics perform in cozy environment at Cafe Skryf, Ambawadi. This show is a show you should never miss even if you’re on a ventilator you should attend this show and then die. A Stand Up Comedy Show / Cafe Skryf- Read. Play. Eat / Comedy (theater) / events in ahmedabad / Funny Hai !/?